In the media industry, the potential disconnect between an advertiser’s strategy and operations can be exacerbated by a rapidly evolving landscape and current challenges around transparency and accountability. Media Operating Models provide the framework that defines how advertisers approach the management of their media investment. They should link the ambition for media with the day-to-day execution of media strategy in order to really drive value. As media has risen up the corporate agenda, these models are now receiving more scrutiny than ever before. The best possible operating model is one that is not only structured and fit for purpose but that is also regularly reviewed and contemporised to maximise both short and long-term business performance. All parties should fully understand their roles and responsibilities, briefings should always be relevant, informative and clear, while strategic and executional recommendations should be well rationalised with clearly defined objectives. Getting the operating model right can really drive business advantage, making your media investment disproportionately effective. 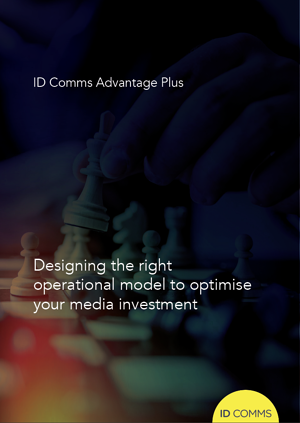 To optimise your media investment, you need an effective structure and organisational design, and this starts with determining your ambition for media. Before you begin to consider the structure you want to implement, you must have a clear view of how your communications process works from insights to measurement, as well as how it contributes to business performance and your competitive brand positioning. This requires you to carefully consider the strategic integration of all consumer touchpoints across paid, owned and earned channels, as well as the contribution of specialist functions. By examining your internal and external resources, assessing their relevance, and benchmarking them against your competitors, you will quickly identify areas where adjustments can be made. Identifying what works well and highlighting opportunities for improvement will allow you to make effective changes. You should also evaluate your external partners, working with your agencies to define the specific resources needed to deliver the Scope of Work, and then being prepared to pay fairly for the best talent. Whilst consistency, rigour and a formal operating model all deliver clear benefits, the key competitive advantage for any business is its human capital. To design effective media operations, it is vital to look closely at your people and skills. According to the ID Comms 2016 Global Media Talent Report, over 90% of marketers agree that identification, organisation and motivation of the right talent is fundamental across the industry and represents a strong factor determining of marketing performance. With the ever-evolving world of marketing generating a constant stream of new skills, agencies have an important role to play in ensuring that knowledge is continually contemporised and updated through regular training and the effective onboarding of new talent. It is critical for all internal and external roles to be aligned with your business ambitions and for the people in those roles to be equipped to fulfil their function. At the same time, your operating model should do more than hold people accountable, it should also encourage innovation and proactivity.